Representing over 10,000 professionals in the San Francisco Bay Area, we are engineers, building inspectors, librarians, chemists, planners, architects, planners, accountants, auditors, computer programmers, building, housing and fire inspectors and advisors, health professionals, managerial and administrative employees and other related public sector professionals. Local 21 members use science every day to do their work on behalf of the public. Science should be a non-partisan issue; good data is never a bad idea! We will be meeting at 10:30 in Justin Herman Plaza near the press tent (view below). 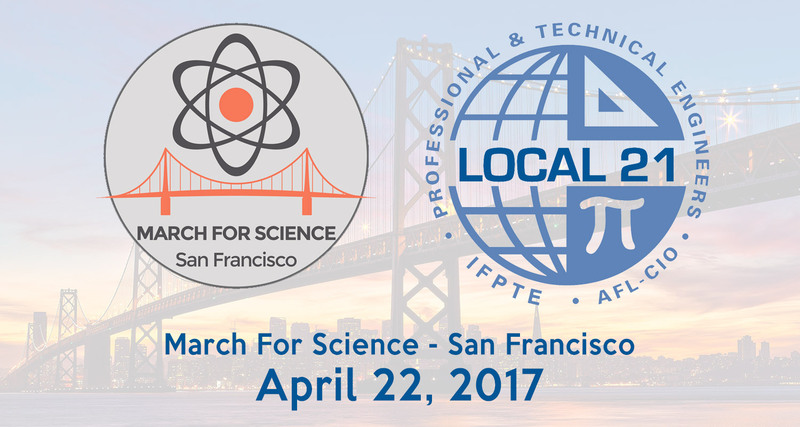 The rally starts at 11:00 am, followed by a march down Market Street to Civic Center Plaza, ending with a fair to celebrate science. Come to the rally and march on April 22 and join up with your fellow union scientists and lovers of facts!